​Yes, you read that right! Dog toothpaste is very much a thing, just like human toothpaste is. Some of us have known about it for a long time, and others will find this whole thing a bit novel. No matter whether you’re a connoisseur looking at this year’s best offerings or just dipping your toe into the subject, this article is sure to help. ​We’ll start off with a bit of information about canine dental care to get everyone on the same page and then get on our list. Let’s go! **Below, you can read more of our detailed reviews for each above ﻿of the Best Dog Toothpaste﻿. You may also﻿ click the links above to read customer reviews and see the current prices on Amazon. ​Dogs are less susceptible to cavities than humans but unfortunately are still vulnerable to all of the significant consequences of bad dental hygiene. Disease, malnutrition and in the most unfortunate cases, even death can result from neglecting dog's dental health. Most people give chew toys to their dog to keep their gums clean. These are great, convenient, and keep your dog entertained. But some chews are too hard for old dogs, and they aren’t as thorough as a good old brushing. ​Just like with humans, brushing provides one of the most surefire ways of keeping your dog's teeth and gums healthy. You should brush your dog’s teeth 2-3 times a week at a minimum. For best results, brush his teeth daily if you can. It’s easier to start when they’re puppies, but as any dog owner knows, even old dogs can learn new tricks. Take it slow at first, use positive reinforcement, and try to find a tube of toothpaste that your dog will like. Let your pooch smell and lick the toothpaste without incentive. That way you’ll know if he'll like the taste and don’t have to force your dog. Slowly, get your dog used to having a toothbrush or a finger brush inside his mouth. Use calm, soothing tones and make sure your dog receives a treat for his good behavior. It might take a few days, even a week or so, for your dog to get used to it, but he WILL get there! ​Can You Brush Your Dog's Teeth with Human Toothpaste? ​No! Like chocolate, fluoride is a substance which is much better tolerated by humans than dogs. Fluoride is toxic to dogs and using fluoridated human toothpaste will make them very sick — if not, worse. Since your dog can’t spit, dog toothpaste is designed to be safe to swallow. The toothpaste listed below are all formulated for dog use and so are safe to consume. No! Like chocolate, fluoride is a substance which is much better tolerated by humans than dogs. Fluoride is toxic to dogs and using fluoridated human toothpaste will make them very sick — if not, worse. Just like with humans, brushing provides one of the most surefire ways of keeping your dog's teeth and gums healthy. Dogs are less susceptible to cavities than humans but unfortunately are still vulnerable to all of the significant consequences of bad dental hygiene. Disease, malnutrition and in the most unfortunate cases, even death can result from neglecting dog's dental health. Yes, you read that right! Dog toothpaste is very much a thing, just like human toothpaste is. Some of us have known about it for a long time, others will find this whole thing a bit novel. No matter whether you’re a connoisseur looking at this year’s best offerings or just dipping your toe into the subject, this article is sure to help. We’ll start off with a bit of information about canine dental care to get everyone on the same page and then get on our list. Let’s go! Petrodex Enzymatic Toothpaste certainly does the trick when it comes to clearing tartar and plaque! A month of regular use will get your dog’s mouth to a clean and healthy state. It prevents tartar a lot faster than many other brands out there. This toothpaste is poultry flavored. For some dogs, this will entice them to use the toothpaste, and for others, it might be a complete turnoff. It smells slightly unpleasant, but if it doesn't bother your dog then this dog toothpaste worth it. If your dog’s not a chicken lover and allergic to poultry, then check out the Sentry Petrodex Peanut Flavored Toothpaste - most dogs love peanut butter flavor so your dog might find this toothpaste yummy and makes it easier to brush his teeth. ​Noticeable clean teeth and fresh breath with regular use. ​Excellent at preventing plaque tartar buildup around teeth and gums, preventing further diseases. ​Dogs enjoy the poultry flavor, making it a lot easier to get them into brushing. ​Also available in Peanut and Fresh Mint flavor. Enzymatic toothpaste use an enzyme called glucose oxidase that, when it comes into contact with glucose and oxygen, kills bacteria. This toothpaste is designed to prevent tartar buildup and fights bad breath. The Petrodex Enzymatic Toothpaste is poultry flavored. For some dogs, this will entice them to use the toothpaste, and for others, it might be a complete turnoff. It smells slightly unpleasant, but if it doesn't bother your dog then this dog toothpaste worth it. ​Some dogs might not like the taste and smell. ​Dogs love the taste of Virbac C.E.T. Enzymatic Toothpaste, a recommended alternative to regular tartar control toothpaste, because it uses a patented dual enzymatic system. Enzymatic formulas are excellent for pets that have a significant accumulation of plaque on their teeth because the deposits are dissolved prior to brushing. 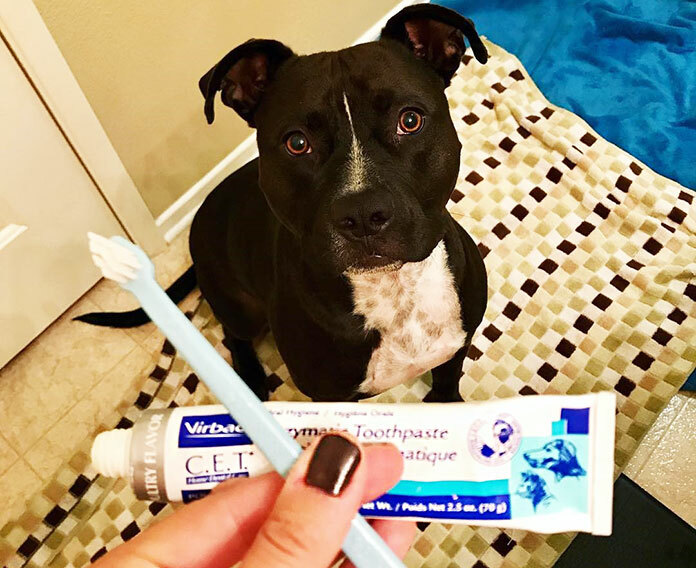 From puppy-hood to the days your dog is a senior, Virbac Enzymatic ​Toothpaste is an excellent addition to your dog’s dental hygiene regimen. ​Safe for pets to swallow, due to a lack of foaming agents. Safe for pets (both cats and dogs) to swallow, due to a lack of foaming agents. ​Leaves pets’ breath smelling fresh, making this toothpaste a top choice for those dogs and cats with symptomatic bad breath. Leaves pets’ breath smelling fresh, making this toothpaste a top choice for those dogs and cats with symptomatic bad breath. ​We love how it contains no toxic ingredients and no excessively potent ingredients or allergens. We love how it contains no toxic ingredients and no excessively potent ingredients or allergens. ​Suitable for cats! We know we’re all dog lovers here, but some of us also like to have cats around. One size fits all! Suitable for cats! We know we’re all dog lovers here, but some of us also like to have cats around. One size fits all! ​It also comes in different flavors, ranging from beef, poultry, seafood and more. You are sure to find a flavor that your furry friend enjoys. It also comes in different flavors, ranging from beef, poultry, seafood and more. You are sure to find a flavor that your furry friend enjoys. ​​Some customers report that some flavors work better than the others, such as the beef flavor cleaning the teeth less than the mint flavor toothpaste. However, your scenario might be different. Dogs and cats love the taste of Virbac C.E.T. Enzymatic Toothpaste, a recommended alternative to regular tartar control toothpaste, because it uses a patented dual enzymatic system. Enzymatic formulas are excellent for pets that have a significant accumulation of plaque on their teeth because the deposits are dissolved prior to brushing. From puppy-hood to the days your dog is a senior, Virbac toothpaste is an excellent addition to your dog’s dental hygiene regimen. The trusted brand that makes indestructible chew toys for your dog also has come out with an effective dental hygiene toothpaste. Nylabone Advanced Oral Care is an excellent choice for people who are looking to balance price with quality. This tartar control toothpaste uses patented “Denta-C,” a scientifically proven ingredient that reduces plaque teeming with bacteria. It's an all-in-one dental kit, it consists of a toothbrush, finger brush and 2 1/2 oz tube of toothpaste. It also comes in three flavors: Puppy - sweet dog-bone (molasses) flavor, Adult - peanut flavor, Senior - meat flavor. If your dog enjoys the Nylabone toys, then they should have no problem with the flavor of the toothpaste. ​​Excellent and effective at removing pesky tartar buildup. 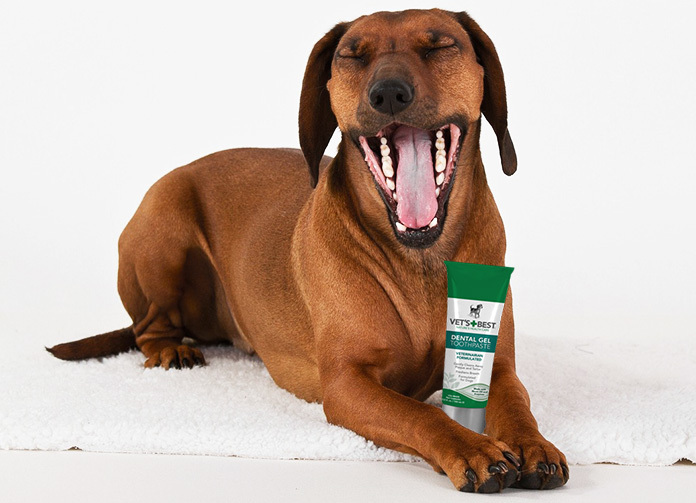 Excellent and effective at removing pesky tartar buildup - it contains Tetrasodium Pyrophosphate, one of the best tartar control agents available for dog toothpaste. ​The fresh smelling scent is very effective against bad breath and dogs love the taste. The fresh smelling scent is very effective against bad breath--and dogs love the taste. ​Safe for dogs of all ages. ​Safe to swallow, no rinsing required. Safe to swallow, no rinsing required. Though Nylabone Tartar Control toothpaste only comes in a single flavor, if your dog enjoys the toys, then they should have no problem with the “sweet dog-bone” flavor (molasses) of the toothpaste. If your dog prefers peanut flavor, check out Nylabone Advanced Flavored Natural Toothpaste. ​Dogs who are prone to quick plaque buildup, this toothpaste may be too weak chemically to keep up. Dogs who are prone to quick plaque buildup, this toothpaste may be too weak chemically to keep up. ​With a name like “Vet’s Best,” you can expect good things from this paste that has been formulated with enzymes, ​aloe​, grapefruit seed extract, and other natural ingredients. These ingredients have been used to gently scrub away plaque and decrease tartar buildup since Ancient times ​— and now, your furry friend can enjoy the same medicinal practices. ​You can choose either just the toothpaste or get the combination pack that features a specialized triple-headed toothbrush. The dental gel toothpaste is distributed by Bramton Company​, based in Texas and made in the USA. With a name like “Vet’s Best,” you can expect good things from this paste that has been formulated with enzymes, baking soda, neem oil, aloe and grapefruit seed extract. These ingredients have been used to gently scrub away plaque and decrease tartar buildup since Ancient times - and now, your furry friend can enjoy the same medicinal practices. You can choose either just the toothpaste or get the combination pack that features a specialized triple-headed toothbrush. The dental gel toothpaste is distributed by Bramton Company LLC, based in Texas and made in the USA. ​All natural ingredients that gently yet efficiently scrub away built-up plaque and tartar. All natural ingredients that gently yet efficiently scrub away built-up plaque and tartar. ​Works well for reducing inflamed gums. ​Excellent option for dogs that have allergies to artificial/natural flavorings. ​Doesn't contain sorbitol and safe to swallow. Doesn't contain sorbitol and safe to swallow. ​Both the single tube or the combination pack are decently priced, making it a worthwhile investment. ​Some dogs are adverse to the taste. Some dogs are adverse to the taste. ​Last, but certainly not least! Tropiclean teeth gel will probably go down as the favorite for people who are new to trying out a dog toothpaste. Why? Because there’s no brushing involved! Tropiclean Fresh Breath Plaque Remover ​Gel is very simple to use. ​Before bedtime, rub two drops into either side of the dog’s mouth where there’s the most saliva. That’s it! The gel works with the saliva to break up plaque and tartar on the teeth. Last, but certainly not least! Tropiclean teeth gel will probably go down as the favorite for people who are new to trying out a dog toothpaste. Why? Because there’s no brushing involved! Tropiclean Fresh Breath Plaque Remover Pet Clean Teeth Gel is very simple to use. Just rub two drops into either side of the dog’s mouth where there’s the most saliva. That’s it! The gel works with the saliva to break up plaque and tartar on the teeth. 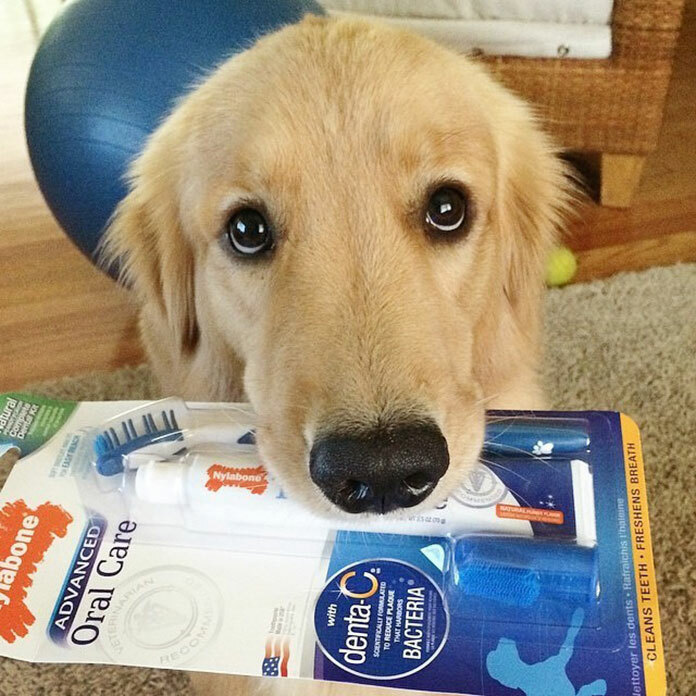 With the teeth gel, there’s no need to get your dog used to brushing. So long as you feel safe sticking a finger in their mouth — and you really should if you get along with your dog — you’re good to go. How easy is that? To top it off, it’s also an all-natural product with no sugar. The only downside to the ingredients list is the use of a natural derived alcohol. While I think this should be avoided, if possible, considering you’re only using four drops of gel on your dog at a time, the quantities really aren’t that worrying. 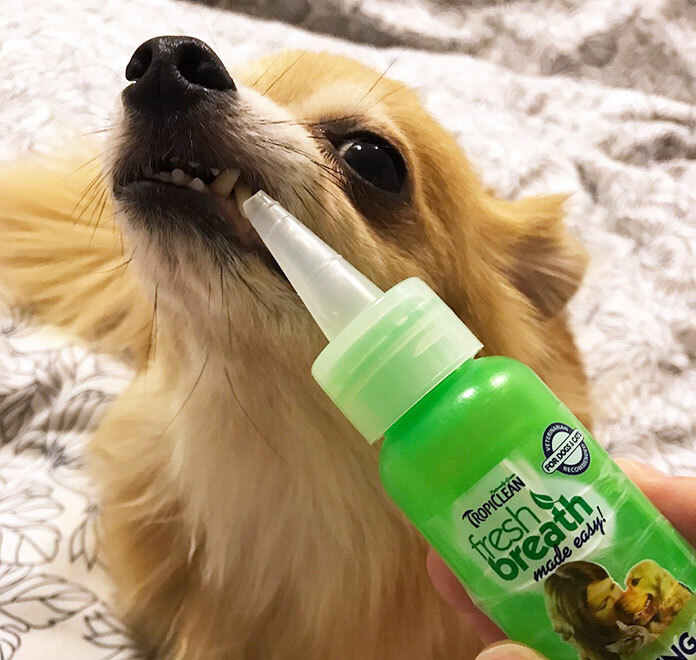 ​With the teeth gel, there’s no need to get your dog used to brushing. So long as you feel safe sticking a finger in their mouth — and you really should if you get along with your dog — you’re good to go. How easy is that? ​No brushing necessary. ​But if you want to speed up the removal of tartar and plaque combined it with regular brushing. No brushing necessary. Get started today! ​​Works great in reducing tartar buildup and ​freshens dog's breath. Works great in reducing tartar buildup and improve dog's breath. ​​​​The gel has a great minty smell to it ​— smells clean and fresh. ​​It helps to soothe irritated gums. ​It helps to soothe irritated gums. ​​It contains a natural derived alcohol. If you accidentally apply too much gel, it can upset your dog's stomach. ​Some dogs hate the minty flavor. 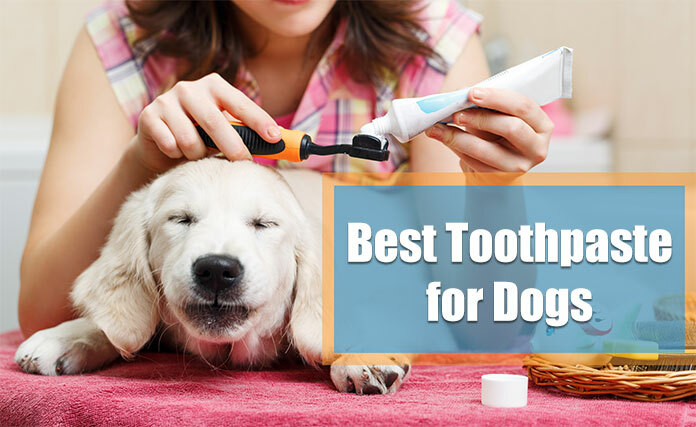 *Disclaimer: Our review on best dog ​toothpaste is based solely on our personal experience, research, consults with experts/veterinarians and information provided by the manufacturers. We do our best to test as many products as we can, but unfortunately, we ​can't test them all. Kindly consider the above recommendations as our opinions. ​We encourage you to consult a veterinarian for advice and suggestions. Great list of dog toothpaste, very helpful. Thanks!